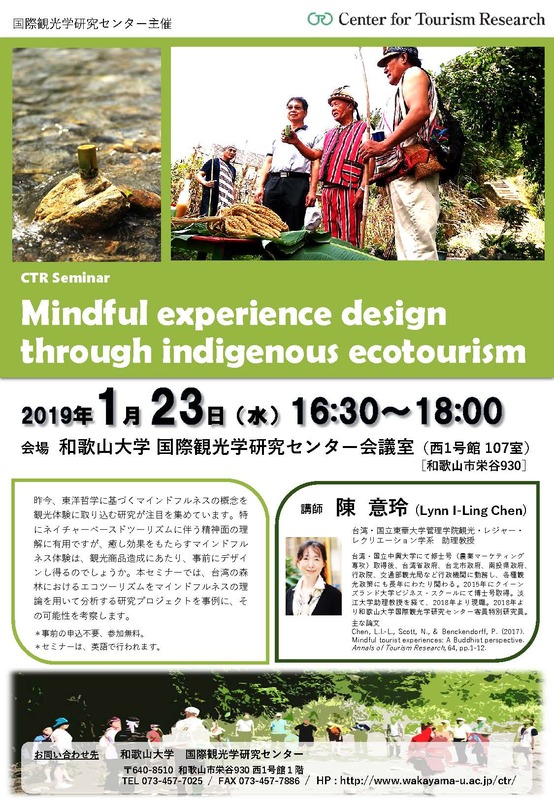 Center for Tourism Research (CTR), Wakayama University, holds a Seminar ” Mindful experience design through indigenous ecotourism. CTR Visiting Senior Fellow, Dr. Lynn I-Ling Chen will present her research project in Taiwan. In her project, the concept of ‘meditative mindfulness’ is applied to investigate experiential benefits in nature-based tourism contexts. *This seminar will be conducted in English. Mindfulness denotes a mental state that facilitate positive experiences. Recently, there is an emerging interest in the application of the concept of ‘meditative mindfulness’ derived from Eastern philosophy to tourist experience in tourism studies. In line with this work, this notion provides a framework for understanding deeper engagement and mental relaxation in nature-based tourism contexts. It would be interesting to scope in more detail how antecedents in tourism contexts could be predesigned to trigger meditative mindfulness episodes that contribute to therapeutic benefits, instead of encountering by coincidence. This seminar will report on a research project applying the theoretical foundation of meditative mindfulness, to investigate activities, settings and other contributing factors as engagements to produce experiential benefits in the context of indigenous forests in Taiwan. It reveals opportunities in the design of mindful indigenous ecotourism products for tourism operators.